The Haqqani Network has proven itself to be one of the most deadly, daring and inventive terrorist organizations in modern times. Based in the Pakistani tribal lands of North Waziristan, the network has a deep relationship both with the Pakistani government as well as the United States. Pioneering the usage of foreign fighters, suicide bombing and target priorities, the Haqqani Network has become a leading organization in the global jihad. The Haqqani’s and their allies have been a priority of the United States in Pakistan and Afghanistan with a massive amount of resources going to fighting the Haqqani influence in the tribal areas of those two countries. Operation Zarb-E-Azb could offer a beacon of anti-insurgent hope in a world of lawlessness in the tribal areas of Pakistan and Afghanistan. However, corruption and Pakistani sympathies with the Haqqani Network make these operations ineffective and the outlook of counter-insurgency in this region bleak. Previously used as a tool on behalf of the United States and Pakistan, blood, money and history run deep in these relationships, lending a perspective on why it took so long to declare the Haqqanis a terrorist organization. Intricate relationships with the government, other terrorist organizations and countries weave an elaborate storyline, which one might think is written for a compelling screenplay. The decision of the Obama administration to finally consider the Haqqanis a credible threat has pivoted United States concentration in the region, leading to significant changes in overall U.S. relations with states in the subcontinent. 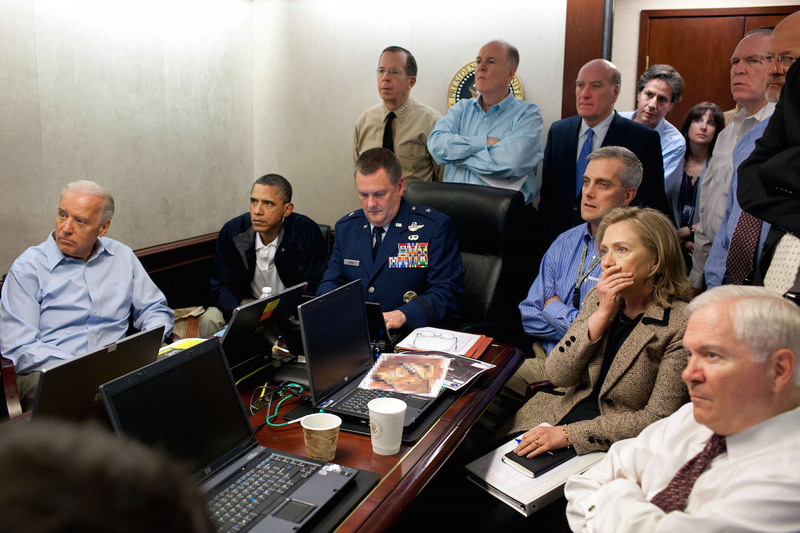 President Obama and his national security team in the Situation Room immediately prior to the targeted killing of Osama bin Laden (May 1, 2011). Photo: Pete Souza/White House. Pre-dating the mujahideen who fought the Soviet Union, Jalaluddin Haqqani founded the Haqqani Network in the 1970s and has provided states, private donors and more “a platform for the delivery of violence” 1 to whoever could pay. Contrary to popular belief, the network was founded before the Soviet invasion and rather was an active fighter on behalf of Pakistan against Mohammed Daoud Khan’s Afghani government. The Haqqanis operate out of the Afghan-Pakistani borderlands, a lawless region largely left untouched by the centralized Pakistani government2. The Federally Administered Tribal Agency, or FATA is home to the vast majority of insurgent organizations, hosting the Taliban, Haqqanis, al-Qaeda, Pakistani Taliban and countless others. The Haqqanis effectively control the majority of North Waziristan, headquartered in the capital and largest city of Miramshah3. This strategic location on the Pakistan-Afghanistan border also provides a number of routes to major Afghan cities such as Ghazni and Khost, themselves leading to Kabul4. Pakistan has utilized the Haqqanis in an effort to limit Indian influence in the region, a long time rival of Pakistan. Installing a pro-Pakistani government in Afghanistan or keeping the country unstable promotes the national interests of Pakistan to prevent being surrounded by pro-Indian interests. The Pakistanis have been slowly inching away from the influence of the United States and towards that of China, an anti-Indian power with aligned interests in the region. This would allow Pakistan to pressure India over the Kashmir border territories especially with the rise of China as an economic and military power. The Haqqanis have benefited from funding, training and arming by the Pakistanis, especially with ISI. This has offered the Haqqanis the ability to launch some of the most audacious attacks seen in modern day, including a 2008 attack on the Indian Embassy and a 2009 attack on the ISAF Headquarters, both in incredibly secured locations in Kabul. The audacity of these attacks can be attributed to the commander, Jalaluddin Haqqani. Touted as a brilliant tactician and innovator, Jalaluddin quickly won the affection of United States CIA officers, Pakistani government officials and United States Representatives such as Charlie Wilson. A favorite mujahideen of the U.S. government, the U.S. has gone to great lengths to keep Haqqani happy, even rush-shipping a portable x-ray machine to Afghanistan when Haqqani was wounded in combat with the Soviets5. While Jalaluddin is the figurehead and leader of the Haqqanis, day-to-day control has been relinquished to his son, Sirajuddin, a significantly more radical religious jihadi in contrast to Jalaluddin who some might tag a freedom fighter. Sirajuddin is much more in line with the ideology of al-Qaeda rather than the traditional ideology of the Haqqani leadership. Much of the Haqqani leadership stays in the family as well, nearly all positions of power are given to relatives and include operational commanders and international fundraisers6. Jalaluddin Haqqani’s first fundraising trips to the Persian Gulf occurred in the early 1970s to support the jihad against the communist insurrection in Afghanistan7. This is supported by a magazine published by the Haqqani network, Manba’ al-Jihad in 1989, establishing historical accounts for the first jihad against Daoud in July 1973 8. As Nixon began providing military aid to Pakistan in March 1973, Haqqani and other networks were likely funded by the U.S. through Pakistan sometime that year. The Haqqanis also operate a number of licit and illicit businesses both in Afghanistan and Pakistan. Car dealerships, tax offices, real estate, construction companies, and money exchanges all act as fronts for Haqqani money laundering in Afghanistan and Pakistan’s major cities. Besides funding from the Pakistani government, Haqqani business also includes illicit elements such as heroin and poppy smuggling, extortion, embezzlement, protection fees and levying taxes on the Pashtun people9. A hallmark of the Haqqanis resiliency and brilliance is its financing. Unlike the Taliban, the Haqqanis have a lasting and significant source of income to fund the jihad and maintain its control over the area. In addition to international foreign aid, the Haqqanis have established numerous foreign aid offices in Persian Gulf countries, giving them access to massive fundraising capabilities. Jalaluddin Haqqani’s wife (name unknown), is a wealthy Arab with ties to the Saudi Royal Family and currently lives in the United Arab Emirates1011. Nasiruddin, one of Jalaluddin’s sons, and Ibrahim and Haji Khalil, Jalaluddin’s brothers were international fundraisers on behalf of the Haqqanis. Numerous accounts establish that the skill of these men in fundraising and gaining sympathy was unparalleled and on a number of occasions, would accrue hundreds of thousands of dollars from Persian Gulf countries on behalf of the jihad. The Haqqanis have been exploiting the hectic nature of Saudi Arabia during the Hajj to infiltrate the country in order to secure financing of the jihad. Bringing home hundreds of thousands of dollars each time, the Haqqani fundraisers exploit the Saudi inability to thoroughly vet each tourist for the Hajj and thus, the fund smugglers are able to slip past Saudi borders unfettered12. This international presence allowed the Haqqani’s to create the first truly global jihad. The Haqqanis had an intricate relationship with Osama bin Laden, lending significant influence to the eventual creation of his al-Qaeda. Initially beginning as a foreign financier of the Haqqanis, bin Laden later established training camps to launch his jihadist group, al-Qaeda1314. The Haqqanis also pioneered international recruitment of foreign fighters for the jihad. Where most mujahideen in the Soviet-Afghan War were natives of Afghanistan and Pakistan, the Haqqanis embraced foreign fighters and actively recruited them as well. The justification for this tactic generates from the translations and teachings of Ibn Taimmiya, Sayyid Qutb and Abul ala Maududi and their interpretations of Salafism15. Incorporating the teachings of Islamic puritanical laws and society, the Haqqanis have promoted these teachings of waging jihad against non-Muslims, and referenced the teachings of Qutb, and Maududi, recognizing that the highest form of jihad lies in combat. The first calls for this jihad against communist Afghanistan, the Soviet Union and the Coalition embraced these calls, created the definition of violent jihad and established the ideology of a worldwide jihad in which all Muslims were encouraged to participate. Many argue that organizations such as the Taliban and the Haqqanis were non-expansionist and simply sought to establish stability in regions and times in which there was a vacuum of authority16. However, the international jihad which they have created and the religious centered jihadist organizations seek to expand the influence of their puritanical Islamic beliefs through violent means. Members of the Haqqani Network are then able to export their skills and ideology to their home country, importing the brand of militant jihadism that the Haqqanis instill in their fighters. The Haqqani relationship with al-Qaeda further supports the assertion that Haqqanis are not looking to simply control the land they are currently on. While it may have started as non-expansionist, the rise of leaders such as Sirajuddin Haqqani has instilled further feelings of Salafist global jihadism. The relationship with other terror organizations continues to get deeper than shared ideology and enemies. The Haqqani’s main headquarters and supply base in Zhawara, Pakistan has played host to al-Qaeda’s al-Farouq training camp and was targeted by Clinton’s cruise missile strikes in 1998 following the embassy bombings in East Africa1718. This was established after bin Laden expanded the influence of the Haqqanis after they played host to him in the early stages of the Afghan-Soviet War, benefiting from his funding prior to the creation of his al-Qaeda19. The friendship of bin Laden and Haqqani is just as deeply rooted as the Haqqani relationship to the ISI. Bin Laden funded and constructed an elaborate network of caves in the mountains of eastern Afghanistan, a stronghold in which to fight the Soviets and eventually the Coalition forces as well. Bin Laden also provided and helped facilitate Saudi mining and construction equipment to help fortify the Haqqani base in Zhawara. Following the invasion of the United States in 2001, bin Laden found a safe haven with the Haqqanis in North Waziristan, a small debt repayment for bin Laden’s assistance with the Haqqani infrastructure. Western and especially United States foreign assistance was routed through the Pakistani intelligence agency, ISI, who in turn purchased weapons and gave funding to the mujahideen groups and their trainers. Brown states that 60% of all funding went towards fighting in the area controlled by the Haqqanis and 35% of that funding went directly through the Haqqani training camp and headquarters in Zhawara. Overall, the United States funded over $2 billion to Pakistan throughout the Afghan-Soviet War, routing nearly $360 million through the Haqqani controlled Zhawara base 22. United States military funding to Pakistan continues to this day at an unprecedented level, surpassed only by Israel, Egypt and Iraq and accounting for 96% of total military assistance in Central Asia 23. The relationship between the Haqqanis, Pakistan and the United States is an incredibly complex one at best. Following the withdrawal of the Soviet forces in 1989, power struggles in the Afghan political vacuum resulted in the Afghan Civil War. Mujahideen such as Haqqani and Mullah Omar came together to establish what would become the Taliban government in 1996. In return for delivering the support of the tribal regions in eastern Afghanistan, Mullah Omar offered Haqqani a position in his cabinet as the Minister of Borders and Tribal Affairs and the governor of Paktia province, long considered positions with very little prestige or power24. The resentment of Haqqani towards the Taliban calls into question the efforts of the Taliban to classify the Haqqanis as members of the Taliban or a separate organization. In the latest manifestation of the Global War on Terror, the Taliban have identified and yet distanced themselves from the Haqqanis at different moments. Mullah Omar and other Taliban officials criticize the UN and US efforts to designate the Haqqanis a Foreign Terrorist Organization, arguing that the Haqqanis are not their own organization, merely a construct under the authority of the Quetta Shura Taliban. However, contact between the Taliban and Haqqanis has never been particularly great, and has soured in recent years. Video and news reports of recent Haqqani attacks, such as an attack on a bank in Jalalabad on pay day, has caused the Taliban to distance themselves from the Haqqanis. This is likely because the Taliban is interested in making peace talks successful, thus requiring them to disassociate with groups who have proven ruthless and technologically advanced. The relationship with the Pakistani government and the United States is perhaps even more confounding. Initially the beneficiaries of massive sums of money from the United States to fight the Soviets, the Haqqanis decided to shy away from U.S. involvement in the Afghan Civil War and later in the U.S. invasion of Afghanistan. Following his decision to join Mullah Omar’s Taliban government as well as his close friendship with bin Laden, the United States refused to utilize Haqqani as a resource in the U.S. invasion in 2001, losing a huge asset already possessing a deep relationship with the United States. Instead, Jalaluddin Haqqani was the third most wanted target in Afghanistan, only behind bin Laden and Mullah Omar, leaders of al-Qaeda and the Taliban, respectively. Many advisors believe that had Haqqani been offered a position in the Karzai government, that the Haqqanis would be supporting rather than fighting the United States, Northern Alliance and Afghan government. The Haqqanis did not initially fight the United States upon their invasion of Afghanistan, rather, the network only picked up arms to fight the Coalition after an American air strike in 2002 killed a dozen women and children at a family compound25. Previously, the Haqqanis and the Taliban had been open to negotiations and the United States had included them in the peace process in Afghanistan, however, upon these bombings the Haqqanis quickly left the table. Talks have not commenced, nor do they look likely as the United States has also captured a son of Jalaluddin Haqqani, Ibrahim. Ibrahim was the primary facilitator and negotiator on behalf of the Haqqanis and the loss of Ibrahim makes the likelihood of Haqqani peace talks that much less likely. The rise of Sirajuddin as the leader of the Haqqanis also makes negotiation look unlikely. Ascribing much more to Salafist global jihadism than his father, Sirajuddin conforms much more to the ideology of the al-Qaeda movement than that of his father. The gradual radicalization of the Haqqanis make a peace agreement less and less likely. The Pakistanis have always utilized the Haqqanis as a paramilitary arm, or shadow organization to project Pakistani power where the Pakistani mark cannot be seen. Primarily used as a tool for destabilizing Afghanistan as well as reducing the influence of India in the region, the Haqqanis offer a certain level of plausible deniability compared to application of Pakistani government resources. The relationship with the Pakistani government, especially with the military and Inter-Services Intelligence (ISI) has called into question the efficacy of Pakistani rhetoric and operations against the Haqqanis and militant insurgents as a whole. Pakistan has little interest in losing a non-disclosed operational arm of the Pakistani military. The resource of violence which the Haqqanis provide the Pakistani government makes them a valuable, deniable asset. The Haqqanis allow the Pakistani government the ability to project power, influence and destabilizing ability to areas were Pakistan cannot be publicly operating. The support of a major government in the region makes the dissolution of the Haqqanis extremely difficult and hard to imagine, especially when the government has a reputation for corruption. The culture of the Pashtun people and the FATA is markedly different from that of those living in the valley. Those in the more urbanized and agricultural lowlands are more reliant, trusting and supportive of strong, centralized government. The Pashtun people in contrast are fiercely independent. The Haqqani and other organizations such as Hezb-i Islami Khalis, Harakat-i Inqilab-i Islami, and Jamiat Ulema-e-Islami seek to see Islamist governments in Islamabad and Kabul, but also wish to see “decentralized, grassroots, and predominantly rural forms of mobilization that emphasize continuity with tribal political culture and Pashtun regional autonomy.”26 This “theocratic federalism” of sorts give hints to the rising ambitions of the Haqqanis and other groups as not being limited to just regional control, but the eventuality of the Salafist global jihad that they are conforming to more and more. The Haqqani’s strong influence over theology students offers it a large base for educated, ideological students. 1.) Brown, Vahid; Rassler, Don. Fountainhead of Jihad: The Haqqani Nexus, 1973-2012 Oxford University Press. Kindle Edition. 4.) Dreazen, Yochi. “The New Enemy in Afghanistan”. National Journal. 14 July 2011. Academic OneFile. Web. 28 Oct. 2014. 5.) Dreazen, Yochi. “The New Enemy in Afghanistan”. National Journal. 14 July 2011. Academic OneFile. Web. 28 Oct. 2014. 8.) Brown, Vahid; Rassler, Don. Fountainhead of Jihad: The Haqqani Nexus, 1973-2012. 2013. Oxford University Press. Kindle Edition. 10.) Dreazen, Yochi. “The New Enemy in Afghanistan”. National Journal. 14 July 2011. Academic OneFile. Web. 28 Oct. 2014. 13.) Brown, Vahid; Rassler, Don. Fountainhead of Jihad: The Haqqani Nexus, 1973-2012. 2013. Oxford University Press. Kindle Edition. 15.) Siddiqa, Ayesha. “Jihadism in Pakistan: The Expanding Frontier.” Journal of International Affairs 63.1 (2009): 57+. Academic OneFile. Web. 10 Oct 2014. 17.) Brown, Vahid; Rassler, Don. Fountainhead of Jihad: The Haqqani Nexus, 1973-2012. 2013. Oxford University Press. Kindle Edition. 18.) Petrou, Michael. “With Friends Like These, Who Needs…” Maclean’s 124.40. 17 Oct. 2011. 38+. Academic OneFile. Web. 10 Oct. 2014. 19.) Brown, Vahid; Rassler, Don. Fountainhead of Jihad: The Haqqani Nexus, 1973-2012. 2013. Oxford University Press. Kindle Edition. 21.) Arif Jamal, Shadow War: The Untold Story of Jihad in Kashmir, Brooklyn, NY: Melville House, 2009, p. 110. Brown, Vahid; Rassler, Don (2013-02-01). Fountainhead of Jihad: The Haqqani Nexus, 1973-2012 (Kindle Location 4329). Oxford University Press. Kindle Edition. 22.) Coll, Steve. “Anatomy of a Victory: CIA’s Covert Afghan War.” Global Issues. Washington Post, 19 July 1992. Web. 28 Oct. 2014. 23.) “Foreign Military Financing Account Summary.” U.S. Department of State. U.S. Department of State, n.d. Web. 28 Oct. 2014. 24.) Dreazen, Yochi. “The New Enemy in Afghanistan”. National Journal. 14 July 2011. Academic OneFile. Web. 28 Oct. 2014. 25.) Dreazen, Yochi. “The New Enemy in Afghanistan”. National Journal. 14 July 2011. Academic OneFile. Web. 28 Oct. 2014. 26.) Joshua White, Pakistan’s Islamist Frontier: Islamic Politics and U.S. Policy in Pakistan’s North-West Frontier, Arlington, VA: Center on Faith & International Affairs, 2008, p. 26 Brown, Vahid; Rassler, Don (2013-02-01). Fountainhead of Jihad: The Haqqani Nexus, 1973-2012 (Kindle Locations 4541-4543). Oxford University Press. Kindle Edition. 27.) Brown, Vahid; Rassler, Don (2013-02-01). Fountainhead of Jihad: The Haqqani Nexus, 1973-2012 (Kindle Locations 1003-1004). Oxford University Press. Kindle Edition. 30.) Siddiqa, Ayesha. “Jihadism in Pakistan: The Expanding Frontier.” Journal of International Affairs 63.1 (2009): 57+. Academic OneFile. Web. 10 Oct 2014. 31.) Petrou, Michael. “With Friends Like These, Who Needs…” Maclean’s 124.40. 17 Oct. 2011. 38+. Academic OneFile. Web. 10 Oct. 2014. 33.) Curtis, Lisa. “Should the United States Cut off Aid to Pakistan?” The Heritage Foundation. The Heritage Foundation, 5 Aug. 2011. Web. 03 Nov. 2014. 34.) Cookman, Colin. “The Limits of U.S. Assistance to Pakistan.” Center for American Progress. Center for American Progress, 18 July 2011. Web. 03 Nov. 2014. 36.) Curtis, Lisa. “Should the United States Cut off Aid to Pakistan?” The Heritage Foundation. The Heritage Foundation, 5 Aug. 2011. Web. 03 Nov. 2014. 37.) Cookman, Colin. “The Limits of U.S. Assistance to Pakistan.” Center for American Progress. Center for American Progress, 18 July 2011. Web. 03 Nov. 2014. 41.) "Blacklisted; The Haqqani network. "The Economist15 Sept. 2012: 38(US).Academic OneFile. Web. 5 Nov. 2014. 42.) 112-168, 112th Cong., 126 Stat. 1299 GPO (2012)(enacted). 43.) "Blacklisted; The Haqqani network. "The Economist15 Sept. 2012: 38(US).Academic OneFile. Web. 5 Nov. 2014. 44.) Dreazen, Yochi. “The New Enemy in Afghanistan”. National Journal. 14 July 2011. Academic OneFile. Web. 28 Oct. 2014. 45.) Petrou, Michael. “With Friends Like These, Who Needs…” Maclean’s 124.40. 17 Oct. 2011. 38+. Academic OneFile. Web. 10 Oct. 2014. 46.) Dreazen, Yochi. “The New Enemy in Afghanistan”. National Journal. 14 July 2011. Academic OneFile. Web. 28 Oct. 2014. 47.) Brown, Vahid; Rassler, Don. Fountainhead of Jihad: The Haqqani Nexus, 1973-2012. Oxford University Press. Kindle Edition. 49.) Bergen, Peter. The Year of the Drone. The New America Foundation. 24 Feb. 2010. Web. 10 Oct. 2014. 50.) Drone Wars Pakistan: Leaders Killed. The International Security Project. The New America Foundation. N.d. Web. 5 Oct. 2014. 51.) Bergen, Peter. The Year of the Drone. The New America Foundation. 24 Feb. 2010. Web. 10 Oct. 2014. 53.) Dreazen, Yochi. “The New Enemy in Afghanistan”. National Journal. 14 July 2011. Academic OneFile. Web. 28 Oct. 2014. 54.) Brown, Vahid; Rassler, Don (2013-02-01). Fountainhead of Jihad: The Haqqani Nexus, 1973-2012. Oxford University Press. Kindle Edition. 56.) Mir, Amir. “How Haqqanis Escaped the U.S. Terror List.” DNA Syndication [Mumbai]. 17 Oct. 2011. N. pag. Web. 28 Oct. 2014. 57.) Brown, Vahid; Rassler, Don (2013-02-01). Fountainhead of Jihad: The Haqqani Nexus, 1973-2012 (Kindle Locations 933-934). Oxford University Press. Kindle Edition. 58.) "The Haqqani Network, a family and a terror group." CNN Wire. LexisNexis Academic. 8 Sept. 2012. Web. 1 Nov. 2014. 59.) “U.S. Aid to Pakistan by the Numbers.” Center for American Progress. Center for American Progress. 21 Aug 2008. Web. 01 Nov. 2014. Ryan H. Gordon graduated in 2014 with a Bachelors degree in Political Science and International Affairs from Northeastern University in Boston, MA.